So glad it is the year of buying nothing. I do love the orange, pity about the misshapen tiger. Every autumn, I kick off the yearly knitwear search. I traditionally buy one piece of knitwear to add to my wardrobe and that is the one I wear for that year. This year I am taking a break from this tradition due to my Year Of Buying Nothing challenge. But I thought I could still have the fun of making a small collection of knits I would go and look at if I were in the market for one. Maybe one of my readers is looking for a new one? I find Rivers to be a somewhat reliable source of knitwear. Last year I bought the Rivers Edge to Edge cardigan in cobalt blue and also in a lovely shade of teal seen above. 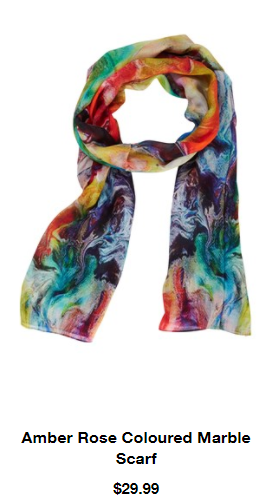 You can get this in several different colours including black. This is very reasonably priced at $21.00. 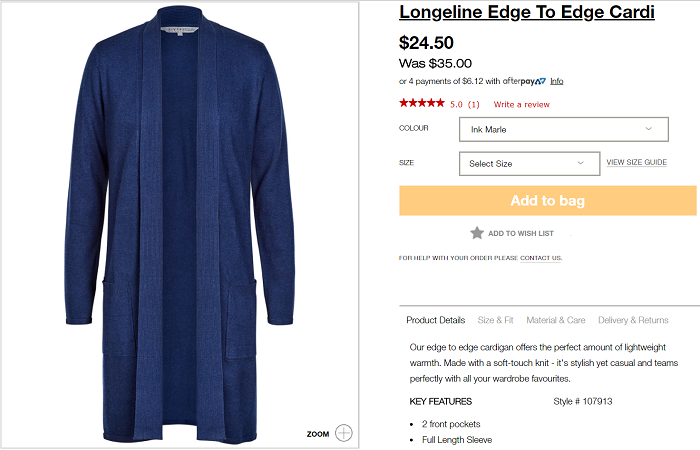 You can also get the Edge to Edge cardigan in a long line version with pockets, shown here in the gorgeous cobalt blue – they call it ink marle.. That is a lot of knit for $24.50! If you prefer a chunky knit, you might like the Fisherman Rib Coatigan. 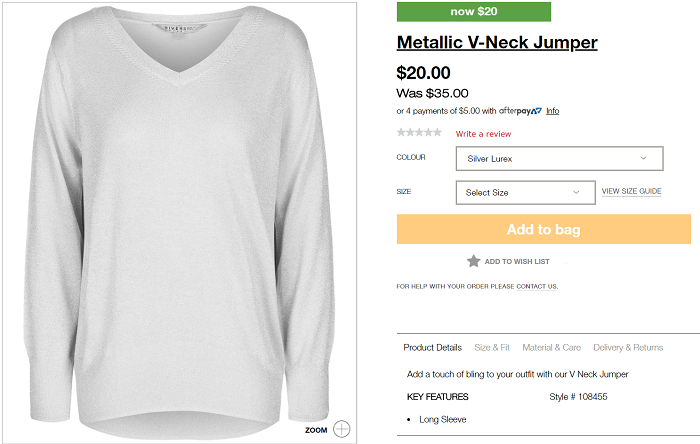 This Metallic V-Neck might be awesome and I would be tempted if it were available in a darker shade. They have silver and baby pink, neither of which are very me. Another semi-reliable Snoskred source of knitwear is Millers – though their clothes can skew very Miss Marple Solves A Murder While Knitting Something New, AKA fluffy. I had a look through their website and only liked this one thing, which I had seen on their ad. Though I suspect it would either be fabulous or NOT great in person. I don’t love the colour but I do like that it has some sparkly. It may be a little early in the season because they only have one poncho in “neutral” which I strongly dislike. I love a poncho generally. Rockmans is one other place I visit for knitwear. I love this knit because it is in the “mixed media” style, but I hate the colours. It also seems to be on the thin side overall, which isn’t a huge problem but sometimes that kind of knit shows every lump and bump on your body. 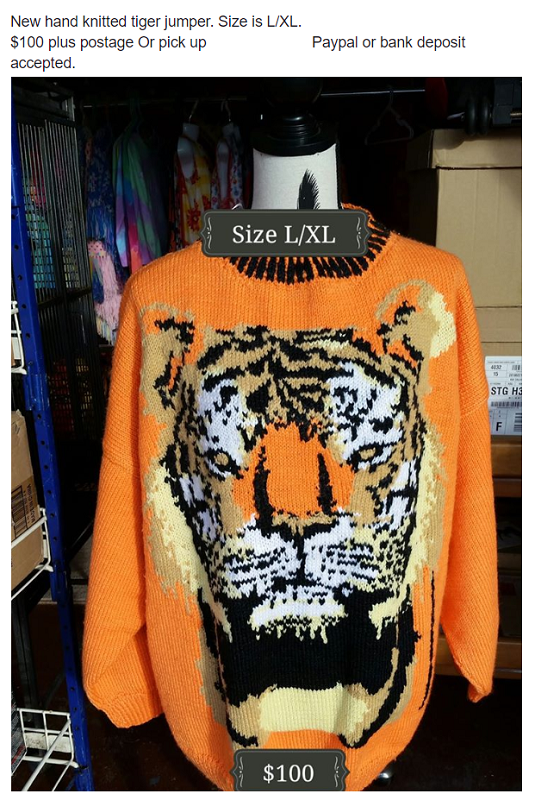 UPDATE TO ADD: I was going past a Rockmans yesterday and I dropped in to take a look at this jumper. It was HIDEOUS as were 99% of the other knits they had in store. I can’t even describe how bad it was. Just so, so BAD! The “wool” looked like the cheapest possible yarn which you would get from a $2 store for .25 cents. Ew. While at Rockmans I spotted this scarf which is completely me. I would never pay this amount for it, but I can keep an eye on it and grab it when it is on super special. 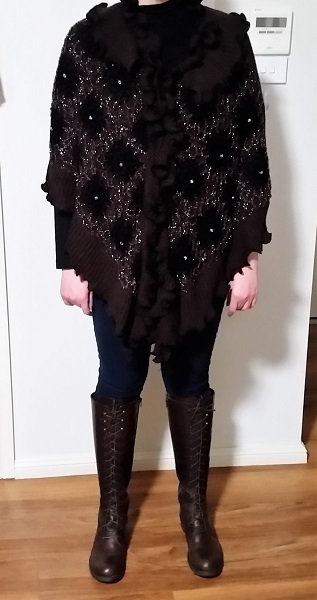 I had my skeleton Carter model some of my winter knits back in 2015, and you can enjoy those posts here. I have been faffing about writing this post for over two months. Every time I would work on it, I would feel like a fraud of some kind. It took me a while to realise why I was feeling this way. The truth is, for the first 30 years of my life, I was extremely unstylish. Jeans and a t-shirt were my go to for going out, and track pants and a t-shirt or bike shorts and a t-shirt in summer were my go to at home. I owned very few – most likely zero for a lot of those years – dresses. I was trying to figure out how and when this changed. My memory is somewhat hazy on this point but I have a feeling two things coincided – I was diagnosed with Aspergers and I began a new job around 2010 where two of the most fashionable people I have ever known worked. One of them was my best ever manager and I have talked about her here on the blog before. And thus the Style of Snoskred was born, and it has been evolving ever since. Anyone who grew up knowing me would be very surprised at this turn of events. I spent most of my growing up years dressing to hide or dressing in whatever fit. There was very little style to be found in my world. I think my Mother is the most shocked of all, and probably not a great fan as I used to be her comrade in unfashionableness. So how did I get here, to this somewhat stylish place I seem to find myself in now? Here are a few thoughts which might help you if you are lost in the style forest. I am not talking about those old style rules like blue and green should never be seen. I am talking about making some rules for yourself in order to make life a little bit easier when it comes to shopping. 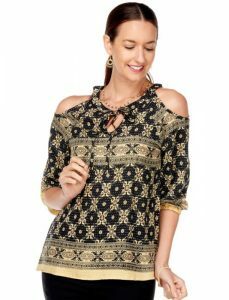 Here is a good example of one current rule that I have – NO cold shoulder tops. 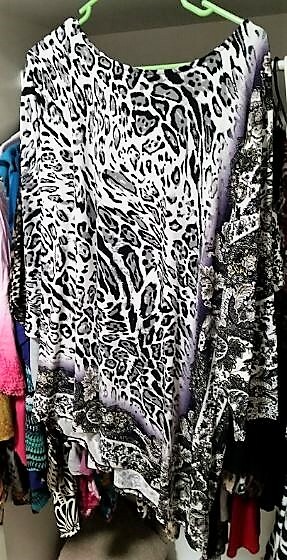 Designers, I do not care how pretty the print might be or how much design you have incorporated into this top or dress. 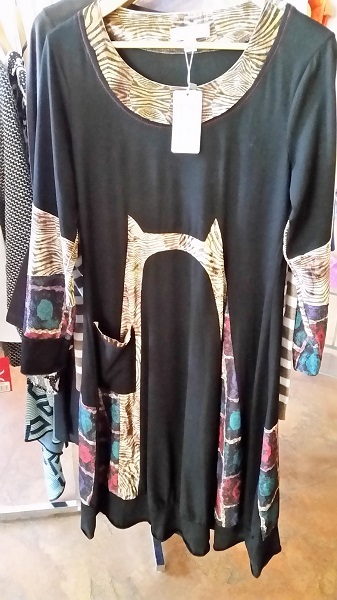 I simply hate this style and I refuse to wear it. Why would anyone think this is a feature I would want? I like my shoulders to be just as warm as the other parts of me. At the moment that can rule out a large area of a shop when I walk in because this style is *everywhere*. I have no idea why. I know some people like it, but in my opinion it is the most inconvenient and stupid thing you can do to a piece of clothing, besides perhaps slashing it with a knife. Hey, that could be the next fashion trend! And hey, it *is* a thing, I saw it in a menswear shop just yesterday. Cold shoulder does not go with one of the major things I do a lot within my wardrobe – which is to layer. Try putting a mesh top under one of these cold shoulder things, it is a huge NOPE. Try putting a cute bolero cardigan over the top, NOPE. I do not own a single cold shoulder thing, nor will I ever. When I was a child there were all these sayings like blue and green should never be seen without a colour in between, there was one about pink and red, too. Blue and green is one of my most favourite colour combinations closely followed by pink and red. You want to wear stripes, wear them. You do not like stripes? Do not wear them. Tabatha Coffey always wears black. But within that colour she plays a lot with texture, mixed media, sequins, and she will very occasionally allow another colour in as long as black is the main colour. Over the past ten years, I have leaned towards three most loved colours which can all be found in a seashell – purple, teal and pink, but I am not afraid to try any colour combination. My family and friends could tell you whether or not something looks like I would like it. That is SO you, is something I hear a lot. My other half has a fashion style which I would describe as chaos. He does not like a stripe. He does not like a pattern that repeats. There are things I know he would never wear and I know better than to suggest them. I know exactly what he likes. If I had to describe my current style in just one word, I would choose some of these words – surprising – unpredictable – eclectic – kooky – eccentric – weird – bizarre – sparkly. 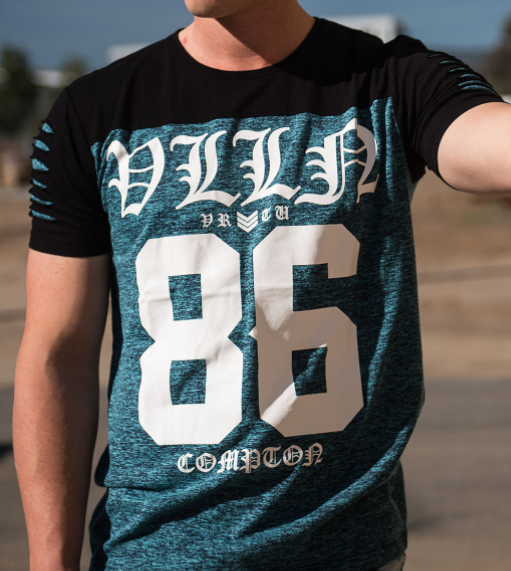 The menswear seen in this post is from the Villains of Virtue range from Ed Harry. It is almost the perfect range for The Other Half, much chaos to be seen. The one thing he does not love are the big numbers seen on some of the outfits. 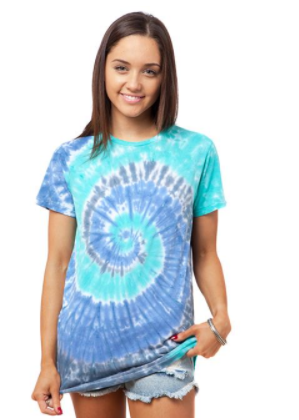 Nobody paid me to put these links here, these are just examples of what I was typing about, but I do love that ocean top and might have to go buy it for myself. ;) Sadly the other half says there is too much gold in the winged top because I do love it. I love the print of the cold shoulder but there will be no cold shoulder tops in this house ever. NEVER EVER! It is a fashion rule I have. Do you have fashion rules? Let me know in the comments! I have never been a “girly” girl – there was never any nail polish in our house growing up. It wasn’t a thing we were into. I am terrible at nail painting due to a lack of experience, talent, and skill. I probably could become good at it with a lot of time, effort, and learning to use my left hand as well as I use my right hand. But realistically that is unlikely to happen. In late 2016 I was having a Good Nail patch – thanks to my daily hair skin and nails vitamins, they were growing stronger and healthier than ever before. 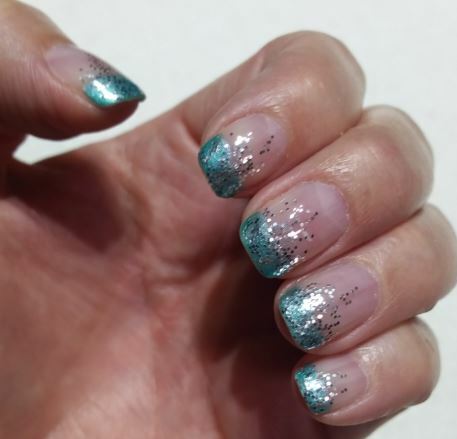 I was using Hard As Nails by Sally Hansen which I would paint on every few days to make the nails shiny and slightly more protected from breakage. 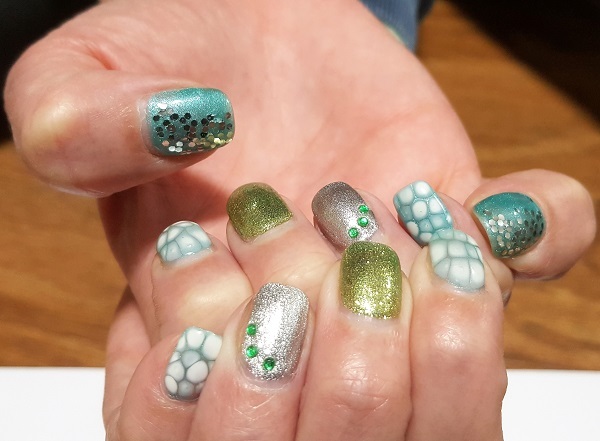 I had wanted to try getting a proper shellac – or gel – manicure for a while but I was very wary. I had heard tales of woe, of unsterilised equipment, of fungal nail infections UGH. I did some serious research and asked around, and one local place kept popping up in the conversations. After a bit of umm-ing and ahh-ing, I bit the bullet and made an appointment. So what is a shellac manicure? This excellent post tells the story of shellac better than I probably could. 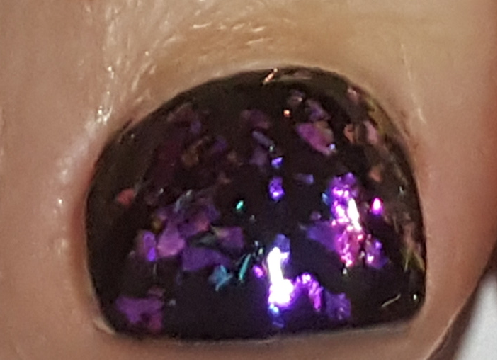 The photos do not really do these justice, it is hard to get a good photo of these nails. To summarize it quickly for you, after each coat of nail polish is applied, your nails “cure” with the help of a UV lamp. 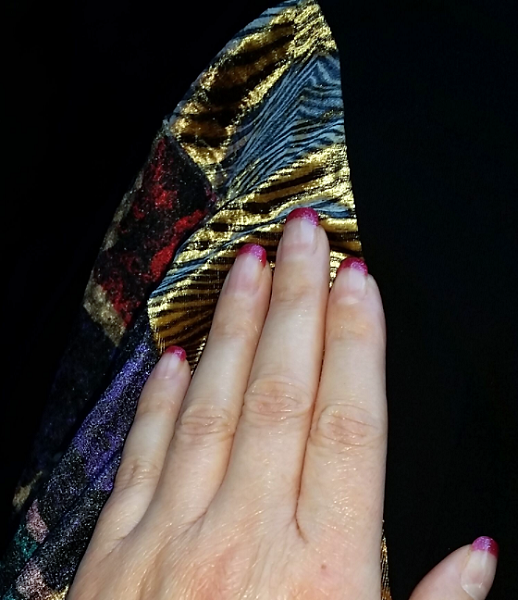 When you walk out of the salon you do not have to worry about wet nail polish. 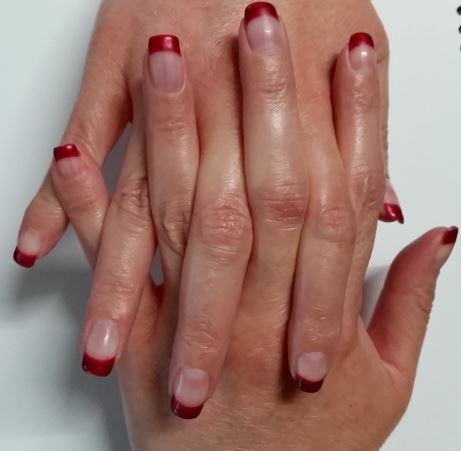 The other benefits include much stronger nails and the polish lasts for 2-3 weeks – and sometimes 4 depending on what you get up to hand wise. Since I started getting the gel nails I have not had a single nail break, and I don’t baby them, they do what they have always done. I have occasionally done a bit of damage to the manicure but you have to work pretty hard to damage it. Most times when I have damaged a nail it has involved metal coathangers, the ones you use to hang up jeans etc. Gel works for me but it does not work for everyone. In particular it would not work well if one had their hands in water a lot. 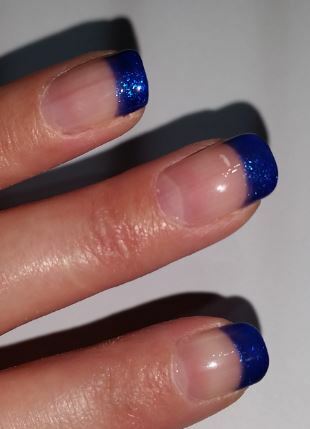 Until I did this, I never realised how having great looking nails can improve your mood. It makes sense now, given that during any day you look at your hands more than any other body part. I prefer the French tip style manicure because if you have colour down to the bottom of the nail you notice a gap as your nails grow. 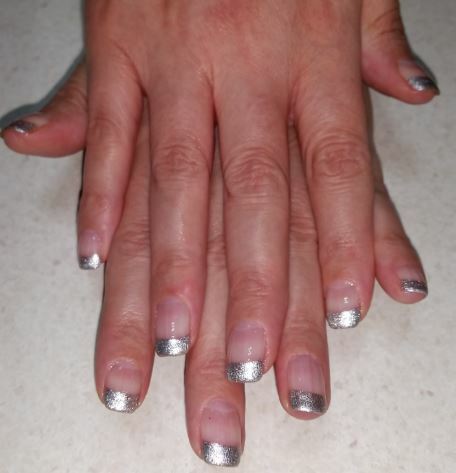 But the French manicures are no longer just white tips, as you see from my many examples here. 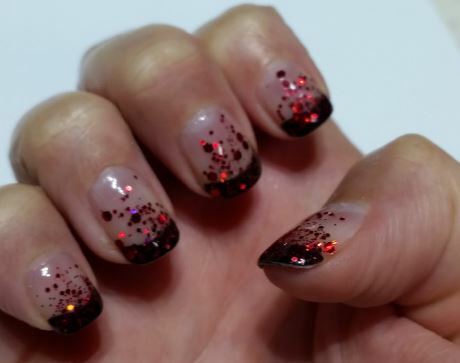 You can choose a colour, you can add some glitter on the top, and probably my favourite manicure so far was black tips with red holographic glitter. I also loved the ones with electric blue and the pastel but very sparkly green. One appointment I arrived early and sat down with the colour charts and made a memo in my phone of all the colours I wanted for future manicures, so I usually know before I arrive what colour I want to try this time. 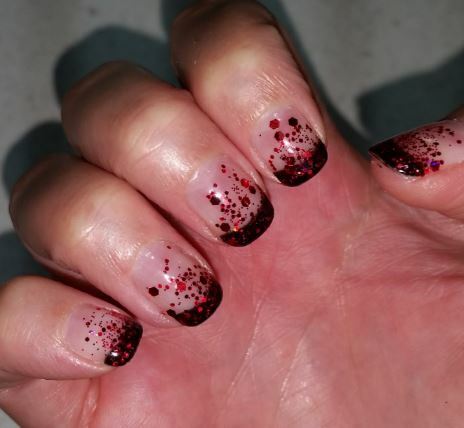 I’m thinking gold is coming up this week but The Other Half loved the black with red glitter, so I see a repeat of that in my near future, as well. 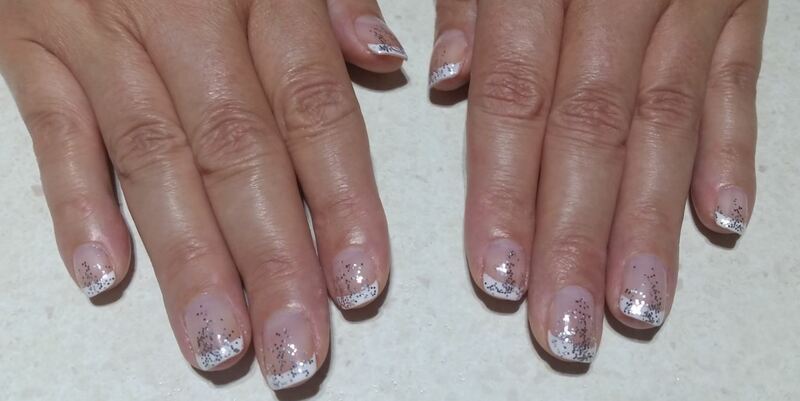 My manicurist thinks I am strange because I always ask her to trim the nails back, she said everyone else wants to keep the length. I don’t need my nails to be long. I just want them to be neat, shiny, and sparkly. 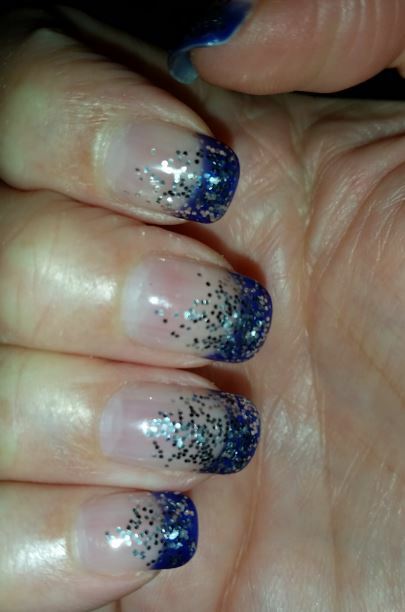 If I let them get too long I begin to have trouble typing. I mentioned in my first post how sizes are never the same across stores and how I always pick up the wrong size automatically – this time I am going to talk some more about the mental change that you need to make once you have lost some weight. A few weeks ago I let the chooks out, and Rosie took off like all the foxes in Australia were chasing her. It was so funny, I took note of the time – it was dead on midday. I said to the other half when he got home he should look at our cameras so he could see Rosie, and what I saw actually shocked me. I could not believe that person on the camera was me. The “I’m much larger than I actually am” mentality is part of the reason why I reach for the larger size automatically. I’m now less than one kilo from my goal weight of 70kg but in my mind I am at least 10kg heavier than that. 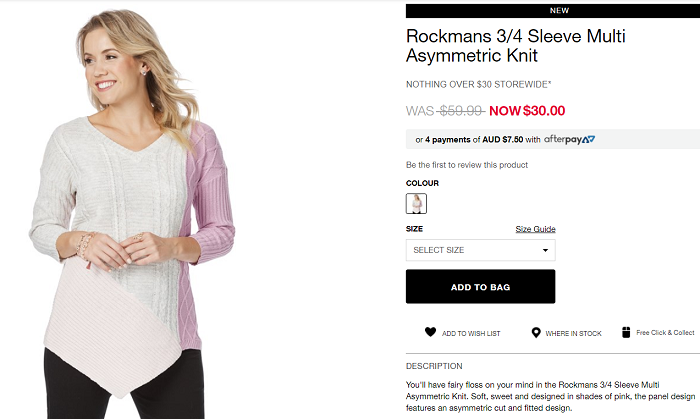 I went to Rockmans recently specifically to look at the “Long Sleeve Dressy Shirt Hem Sequin Knit” you see above. 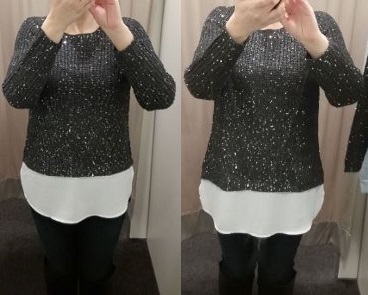 I’d been looking for a top with some sparkle that I could wear under my leather jacket. I love mixed media pieces and this chiffon hem thing seems to be a big trend here this year, though I bought several pieces like this on my Hawaii trip in 2013. This chiffon hem is just that, literally a hem added on to the bottom of the jumper. 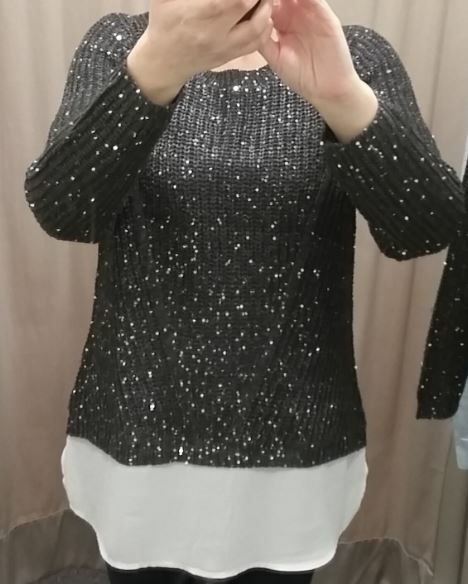 The jumper itself can be a little scratchy because of the sequins in the knit, just so you know. 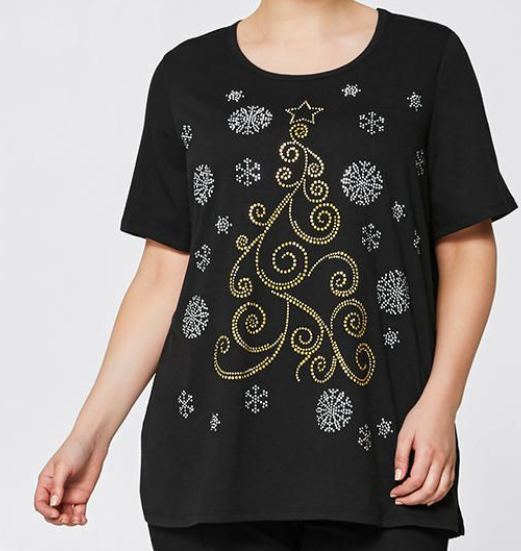 But it was exactly what I was looking for and there is such little sparkly out there in the shops this year. Recent experiences have taught me to take more than one size into the fitting room and in this case I took in the small and the medium. I tried on the small first and was shocked when it fit perfectly. To all of this I said SHUT UP I am getting the small because it fits better. And so I did, plus BONUS it was half price so I got it for $30 and here it is in an outfit. That inner voice trying to tell me incorrect things is one reason why shopping can be an exhausting experience. In this case I had specifically gone to try on this one thing so it was a little easier and this was the only shop I went to, so it was less tiring than usual. Picking out things you want to try on before you even leave the house is a great way to go about this task, I have discovered. 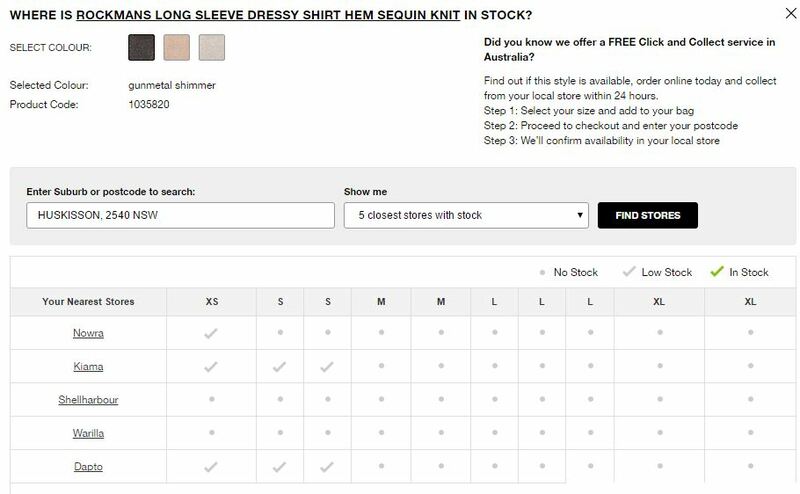 The obvious problem can be it might not be in stock at your store in your size but some stores now have the ability to tell you whether an item is in stock at your store. Rockmans is one of the stores that can do this. 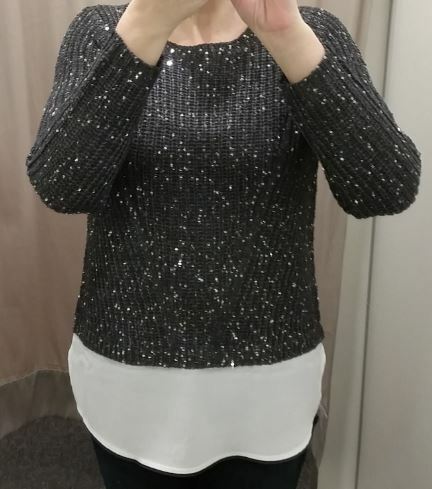 After my recent shopping adventures I now have quite a few new loyalty cards and some of these shops now send me daily emails which can be great if you are wanting to get something specific when it is on sale like I did with this top. 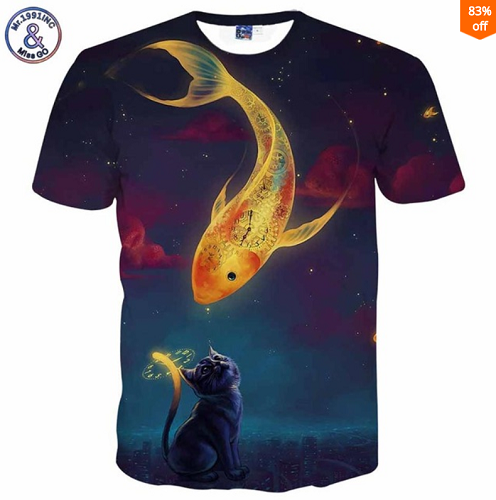 I have a number of items bookmarked for future purchase when they are on sale or on clearance, if I miss out on them in my size then it is not meant to be. Not long after the Millers shopping trip I mentioned in part 1, I was about to head out for the day and picked an outfit. I was unhappy to find that my mesh top which was part of this outfit no longer fit me. Mesh tops are something those of us who do not love our upper arms depend on, to enable us to wear sleeveless tops and dresses. They can also turn a low cut top into something less cleavage-tastic. All of mine were from Ezibuy. 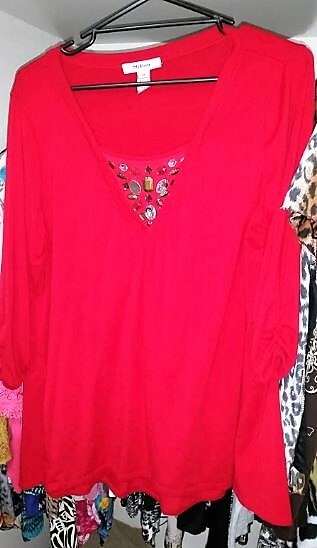 Over the past 15 years, I had bought that top in blue, red and white, plus several black ones, all in size 16. No problem, I thought. I will just go back and order some more of those mesh tops in a smaller size. 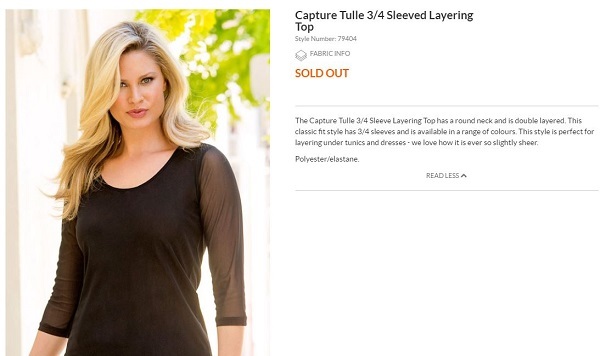 Only one small obstacle – the Ezibuy top was now sold out. So I put aside a day for wandering the local shops in the hopes I could find one. HAHAHHAHA. I would have better luck finding a unicorn. In desperation I went into shops I would never have thought to look in, and not only did I not find my mesh tops, I did not find anything in those places that I liked at all. Ok then, let me search the online shops. HAHAHAHHA. After a couple of hours of fruitless searching, I was getting very cranky. Then I remembered one of my old school reliable backup online shops – TVSN. 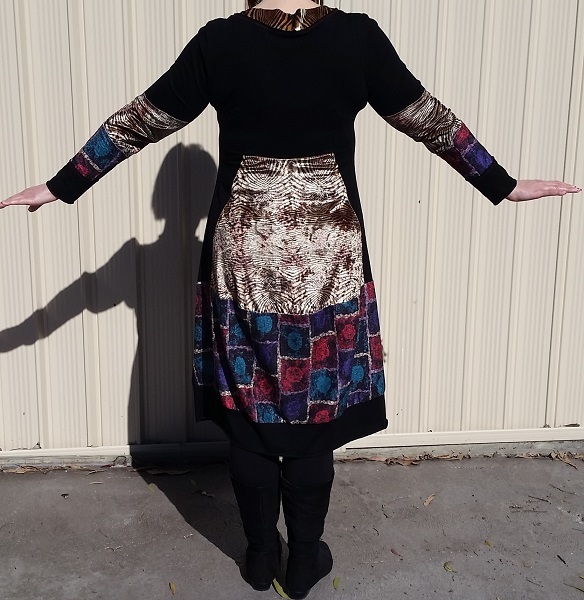 Happily they had this one, and unsure what size to get but knowing mesh tops can often accommodate more than one size, I bought the 10 and 12, figuring I could either send back the one that doesn’t fit quite as well. When they arrived they both fit well but the 10 was better overall and that is the size I would order next time. I kept the 12 as well. When I bought it only the black was available, however they have a range of other colours that go in and out of stock and I was tempted to invest in a few more this past weekend, until I clicked on the size button to find red was the only colour left in my size. These tops are super popular and with good reason. 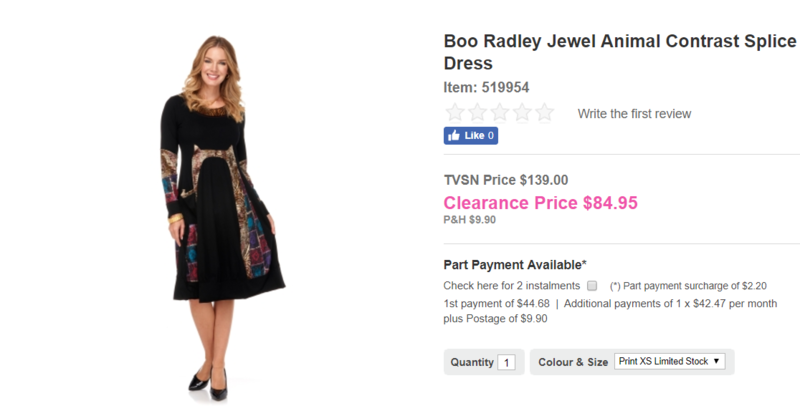 I like the Boo Radley one more than the Ezibuy one, it has a slightly higher neckline. The other must have layering item for those who do not love their arms is a shrug cardigan. I had to pack away a few after winter last year because they were way too big. Now, two of my most favourite shrugs in teal green and pink no longer fit me. This means I am left with two shrugs that work – these are a lurex glittery stretch fabric which will work for me at most sizes. It seems from all my searching, the shrug is out, and longer cardigans are in. Sometimes even ridiculously long! That photo is the purple floor length cardigan. 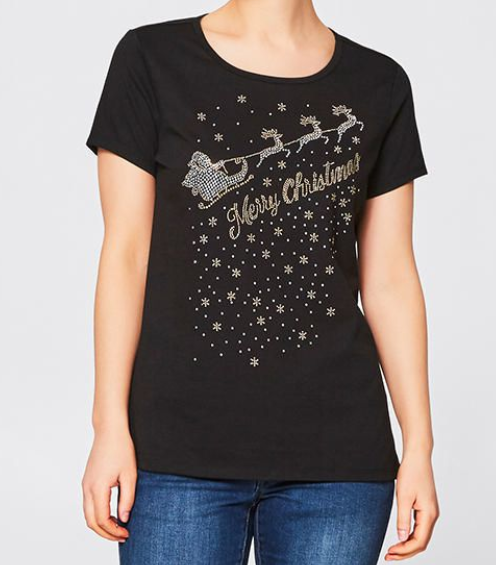 Zulily is a site I have never shopped at yet but I do browse it quite often and get their daily emails, it has a lot of stuff which is my style mixed in with a lot of stuff that is not. I did manage to find a couple of shrugs in my travels but they are both black, I could not find a shrug in a colour at all. I will keep looking but I am not very hopeful. Just to give you an idea of how much of my wardrobe relies on these mesh tops and shrug cardigans – here are all my sleeveless things. There are more than 30 items here. 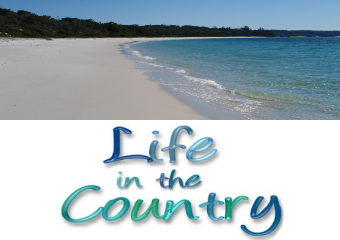 Sometime in November 2016, we made a trip to Shellharbour which is the largest of the nearby shopping centres. We being my parents, the other half, and myself. Mother loves Millers and I am not adverse to the place because I find a lot of great shrug cardigans there. In fact all the shrug cardigans I own originated at Millers. Sometimes Millers have stuff that works for me – it can also skew very “Queen Mother” from time to time, mixed in with stuff you might find in the wardrobe of Duchess Catherine. 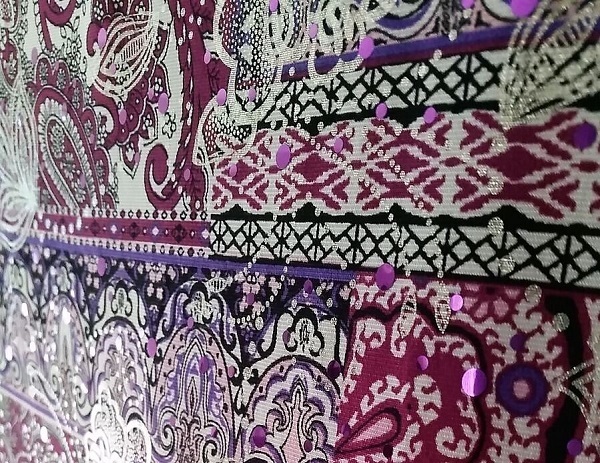 They had these dresses which had silver foil metallic printing on them, plus these round metallic spots which are kind of sparkly. I’m always on board for sparkly, in fact one of my nicknames is sparkles. So I grabbed a size 16 off the rack without even thinking about it, tried it on, and it was far too big. The 14 was brought to me – still too big. Then the 12 – which fit. 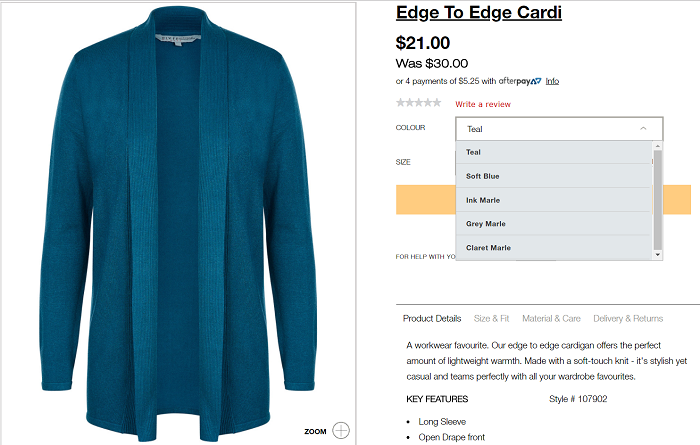 I tried on a shrug cardigan in large – way too big. Medium, still too big. I ended up with a small that fit perfectly, and after purchasing both of these items with glee, I left the store somewhat in shock. The last time I bought shrug cardigans at Millers, I bought the EXTRA large. XL – L – M – S. That is a huge change for me. Sizes are never the same across stores. You can be a 10 at one and a 16 in another. Over the years I learned not to let the sizes concern me greatly. When everything that fit was XL, that was actually pretty easy. My body might be smaller now but my mind is still stuck in XL, it seems. I cannot look at a piece of clothing and know whether it will fit or not – and if I try, I end up with something way too big. Now I just keep trying things on until they actually fit which means a visit to a store can take 30 minutes to an hour. The bottom line is – I am smaller, fitter and healthier than I have been for many years – and this means much of my wardrobe no longer fits me well. Some of my most favourite clothes which have been reliable wardrobe staples for years are now way too big. Most of the stuff you see in that photo up there is 2-4 sizes too big. This meant it was time to do some shopping, and over the past few months I have tried to do that with limited success. You would think it would be fun, right? NO. 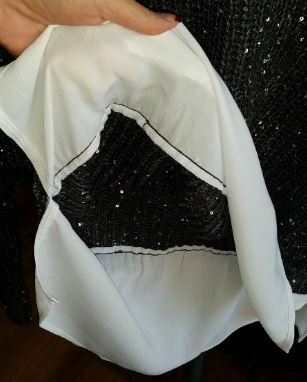 Especially when you already have things you love in your wardrobe, like this Alfani asymmetrical tunic from Macys which has little black sparkly crystals all over it and cost me something like $10. I have had this for 5 years. 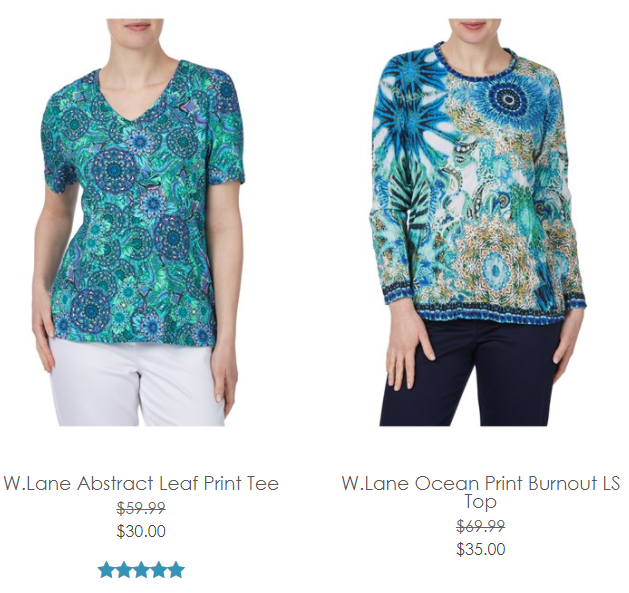 Or like these style and co tops from Macys which I loved so much I bought in every single colour they had, for the huge price of $15 each once they took off all the discounts. These I have had since 2010. They have a little sparkle, they were perfect for work or going out. The amount of wear I got out of these.. and they are all still wearable, for someone else but sadly not for me. Just too big. Fashion runs in cycles, and right now walking into any “trendy” store is like walking into my closet in the late 80’s early 90’s. It is fashion deja-vu. Velvet bodysuits. BODYSUITS WTF. Hotpants. Cropped bomber jackets, some in velvet, one of which I did buy. Floral dresses akimbo – some of which I swear I actually owned back then. STIRRUP PANTS. Need I say more? Given that we are listening to 90’s tracks in the car a lot right now, walking into those shops after driving there listening to the music I would have been listening to back in the 90’s feels about right. And sometimes I will see a thing and it takes me back to a moment in time or an outfit I used to wear, and I am right back there. What I am trying to say is, this fashion time warp is really freaking me out. 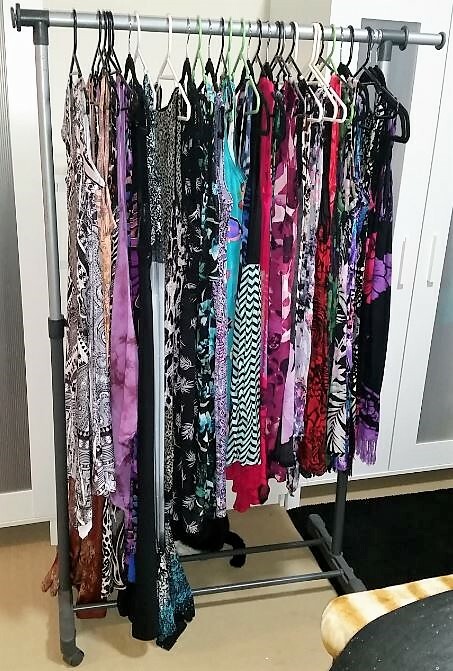 In order to find anything worthy of adding to my wardrobe, I have had to pick through an incredible array of Shiznit I Would Never Buy Or Wear In A Zillion Billion Years. I have had to walk past a lot of plus size shiznit which I totally WOULD buy but cannot get in my size anymore. 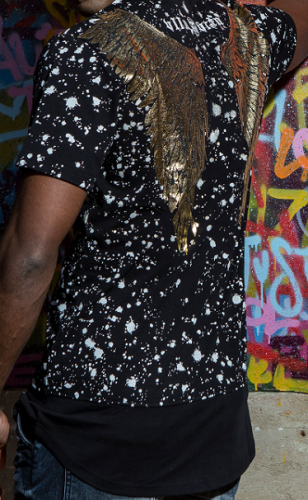 I know who I am fashion wise – it would be described as quirky, eccentric, unusual. You can’t just find that anywhere, though it is easier to find that in the plus sizes than in the smaller sizes. 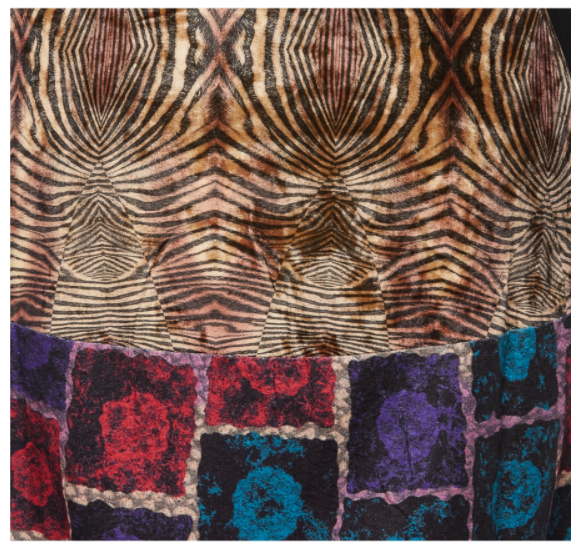 I like bright colours, metallic accents, foil prints, crystals, animal print and plays on animal print. I like to layer. Actually finding those things, well, that is another story. 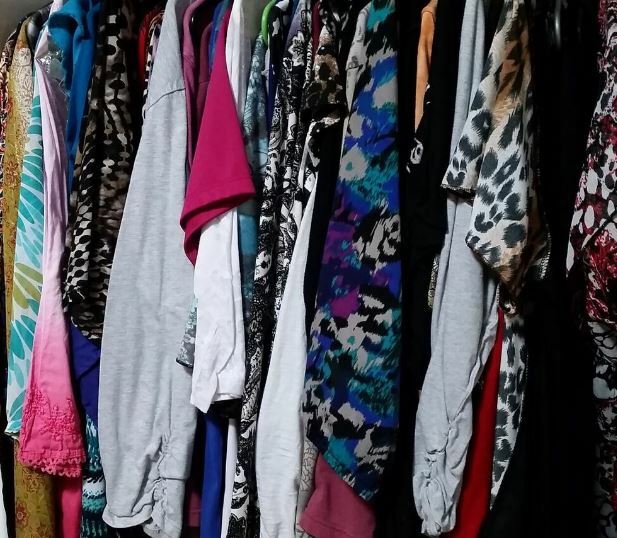 It requires patience, time, effort, and a willingness to hunt through the junk to find the gold OR finding a store that is full of stuff you like in sizes that fit you. Out of all the “shopping mall” stores in Australia right now, the one that is probably closest to my style is Noni B. They also have some stuff that can skew very “Queen Mother” but in between that, they have some stuff which seems to have been designed with me in mind. Like this Billie dress – this is exactly me, in dress format. I did not buy it because Sephyroth just brought me a bunch of great dresses from the USA when he visited back in October. Next week in part 2 – using layers to expand my options.